As a blogger who not only blogs for fun, but also a little money, I'm constantly looking for ways to get more exposure for my tutorials and projects. Aren't we all? Lets face it, there's so much competition these days. You have to really work to get yourself out there. Over the years I've discovered a few great sites that have helped boost my page views tremendously. Today I want to share them with you! Craft Gossip: You can submit a craft in a wide variety of categories on this site. Just fill out the form and make sure to select the right category. I've had a lot of luck with getting stuff featured here. Craftgawker: This site has probably made the biggest difference in my monthly page views. I went from 25,000 page views to over 50,000 page views the first month I submitted projects and got featured and it keeps getting better the more I projects I submit. This site is quite competitive though. You have to have really great photos to get featured, but it's worth the effort. Saved by Love Creations: This site featured my Tin Can Lanterns last year and I still get lots of page views from this site. I have to admit though, that I didn't actually submit my tutorial for this one. The blogger found my project on her own so I don't know exactly how hard it is to get featured on there. DIY Cozy Home: This is one I stumbled on recently. I've gotten over 2,000 page views from it this month! Dollar Store Crafts: Another great site for low cost crafts. 30 Minute Crafts: Submit craft tutorials that take either 10, 15, or 30 minutes to make. Cool Stuff! Tangled Happy: This one is for crochet projects. I think everything I have ever submitted to this one has been featured. Awesome! Ravelry: A large database of crochet and knitting patterns. You can post your patterns for free or sell them. All Free Sewing: Submit sewing tutorials or patterns here and you'll get quite a few more page views. So.......am I missing any? What sites have helped promote your work? Please share! Thanks for posting about this! There are some new sites here that I haven't thought of. I would add knock off decor.com for decor projects. This is superb. Thanks for sharing . Thanks for including Totally Tutorials in your list. I always enjoy what you come up with. Wonderful idea!! !Thank you for sharing!!!! Wonderful list! Thank you for publishing it! Thanks for sharing this great list! As a new blogger, I really appreciate it. Thanks for the list! I'm a newbie, so I guess I better get busy with this list lol! Thank you so much for sharing this great list with us! I'll definitely be sure to submit some of my crafts to them! Found this post via the Inspiration Board at Carolyn's Homework! This is GREAT! Thank you so much for compiling this list! I'm actually putting together my first craft tutorial this week, so this came at just the right time! Thanks for sharing! Thanks for the list. I knew of some of these but found some new ones. Wow! Thanks for sharing. I hadn't even heard of half of these. Thanks for sharing this - I see a few I've had good experiences with and discovered a few new ones to try! I am now thinking about joining one of these! Thanks for this great list - pinned it. If you have time you may want to link to my link party, we have over 100 bloggers lining weekly and I think they would like this info. I haven't had too much experience with this yet, but I did have more hits from being featured on Better After, a site that highlights all kinds of makeover projects. It's a fun site to just check out too. This is brilliant. I keep meaning to join Craftgawker, so it's good to know it's at the top of your list. 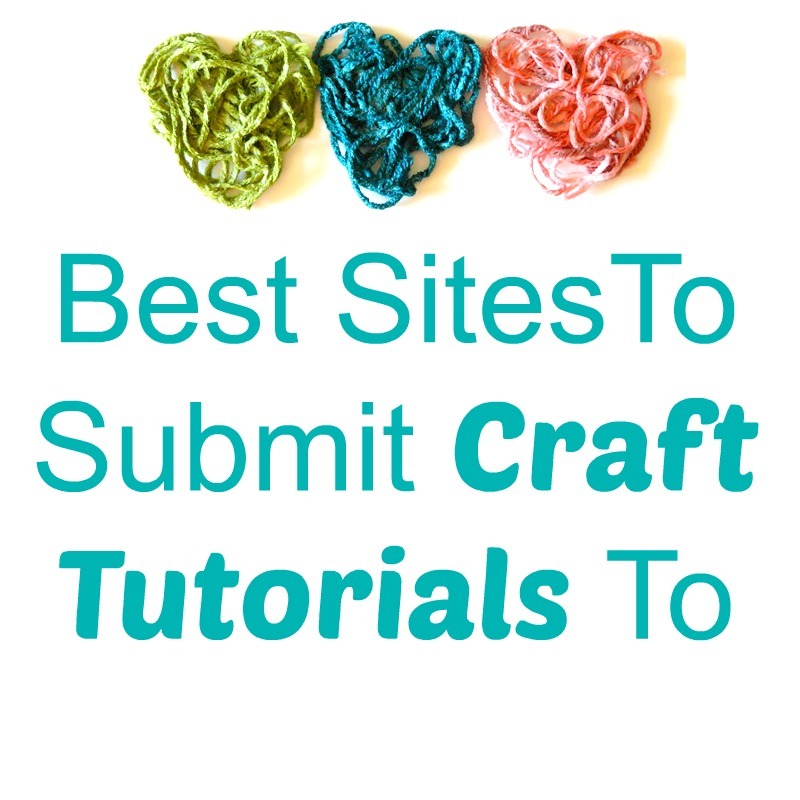 I've also found a site called find and craft ( http://findandcraft.com/ ) that you can easily submit tutorials to. I've put some of mine on already. You can check out my blog at www.fallfordiy.com to see the kinds of tutorials I do. Thanks so much for these! This is such a great post. I'll be referring back to this a lot! Thanks a lot. This was exactly what I was looking for. I recently made a video tutorial for some brooches and I wasn't sure what to do about it.